By Keith Cowing on April 30, 2018 10:40 PM. Keith's note: In case you are interested in other ways that NASA is going to do the Lunar landing thing, this is the NASA Procurement notice for "Commercial Lunar Payload Services - CLPS"
"NASA's release of a draft request for proposal for the delivery of lunar payloads to the Moon via commercial services is the latest step in the agency's expanding efforts in Lunar Exploration combined with support for the development of a the commercial space industry. NASA requires transport services to the lunar surface for instruments and technology demonstration payloads. This DRFP is the latest step in a long-running effort by NASA to support the development of commercial lunar capabilities considering the Moon as a destination for future human spaceflight. In the DRFP, NASA seeks to contract with the commercial sector to deliver scientific payloads to the Moon." By Keith Cowing on April 30, 2018 1:29 PM. By Keith Cowing on April 29, 2018 11:25 PM. Keith's note: We've all heard about those misleading campaign ads on Facebook. Well, while the campaign ads are under scrutiny big aerospace companies are quietly luring people to websites that are not what they seem to be at first glance. This ad is currently running on Facebook. 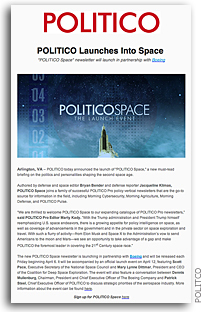 According to the coding embedded in the link it is "campaign=acquisition_newsletter_tier-two-space-race-b" and I am an "enthusiast". When you go to the link it sends you to this page at watchusfly.com (registered by Boeing in 2016) which says "America is in a modern-day space race, and Boeing is leading the charge by building the spacecraft that will keep us in the lead. Boeing's Space Launch System is the world's largest and most powerful rocket. It is the foundation for America's plan to send humans to Mars. Boeing's Starliner is a re-usable capsule that will soon be the method NASA uses to send astronauts into space." But when you go to this page for more information it says "NASA's Space Launch System provides a critical heavy-lift capability, powering people and cargo beyond our moon and into deep space." For starters NASA is building the SLS. Boeing - along with Lockheed Martin, Aerojet, Orbital ATK, and Airbus are building the pieces. One page says it is Boeing's SLS. The other says it is NASA's. Which is it? And yes, Starliner will be sending human crews into space but it is not "the method NASA uses to send astronauts into space." It is one of the methods - SpaceX is another method. 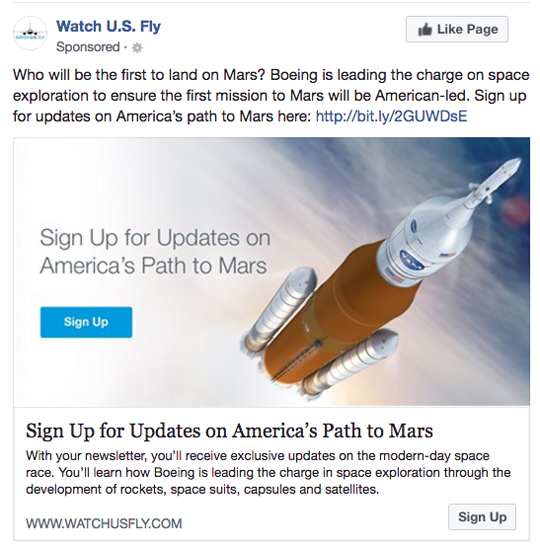 Continue reading Boeing's Misleading Anti-SpaceX Pro-SLS Facebook Ad Campaign. By Keith Cowing on April 29, 2018 8:32 PM. "New Shepard flew again for the eighth time on April 29, 2018, from Blue Origin's West Texas Launch Site. Known as Mission 8 (M8), the mission featured a reflight of the vehicle flown on Mission 7. The Crew Capsule reached an apogee of 351,000 feet (66 miles, 107 kilometers) - the altitude we've been targeting for operations. For the second time, Blue Origin's test dummy "Mannequin Skywalker" flew to space conducting astronaut telemetry and science studies. The flight also carried research payloads for NASA, the German Aerospace Center (DLR), and commercial customers." Is @JimBridenstine Actually The Voice of Jim Bridenstine? Yes. By Keith Cowing on April 29, 2018 7:58 PM. Keith's 29 April update: Looking back at my original posting I realized something that I had totally overlooked - something that someone like me should have paid much more attention to. In looking at @JimBridenstine tweets I saw speech patterns that I did not associate with the way that Jim Bridenstine talks. Of course, I did not stop to think that @NASAWatch - and NASAwatch.com - have a voice that is mine - but different than the way I actually speak. I have been doing this for so long I make the switch without thinking. Jim Bridenstine has surprised a number of people by diving directly into the use of social media. On one hand you want a NASA PAO strategy and filter on what the agency says and how it says it. On the other hand, these layers of filters can stiffle spontaneity and make it harder for NASA's new leader to chart his own course. Just take a look at how @ElonMusk does things. From all accounts I've heard thus far, NASA HQ was initially taken aback by this - and it is going to have to adapt to this new way of engaging with social media by its Administrator - not the other way around. This should prove to be interesting. Keith's 28 April update: OK, so I guess this answers my question. Bridenstine's first public interaction with snarky NASAWatch and he made me eat my words. He learns fast. Yes. Is @NASAWatch actually the voice of Keith Cowing? Ad astra! Continue reading Is @JimBridenstine Actually The Voice of Jim Bridenstine? Yes..
By Keith Cowing on April 27, 2018 6:03 PM. Keith's note: I just heard from NASA PAO "As you know, our statement and the Administrator's tweet are now out. Regarding the LEAG letter, yes, there will be a response. In addition, we are working on cost and will get back to you." "April 27, 2018 - Update: NASA is developing an exploration strategy to meet the agency's expanded lunar exploration goals. Consistent with this strategy, NASA is planning a series of progressive robotic missions to the lunar surface. In addition, NASA has released a request for information on approaches to evolve progressively larger landers leading to an eventual human lander capability. As part of this expanded campaign, selected instruments from Resource Prospector will be landed and flown on the Moon. This exploration campaign reinforces Space Policy Directive 1, which calls for an innovative and sustainable program of exploration with commercial and international partners to enable human expansion across the solar system, including returning humans to the Moon for long-term exploration." Keith's earlier note: It would seem that NASA Administrator Bridenstine is responding directly via @JimBridenstine and not through normal PAO channels. I sent the following request to NASA HEOMD, SMD, and PAO earlier today. I have not received an official response yet: "On 26 April 2018 the Lunar Exploration Analysis Group (LEAG) sent a letter to NASA Headquarters stating that the Resource Prospector mission had been cancelled by NASA and that no explanation has been offered as to why it was cancelled. 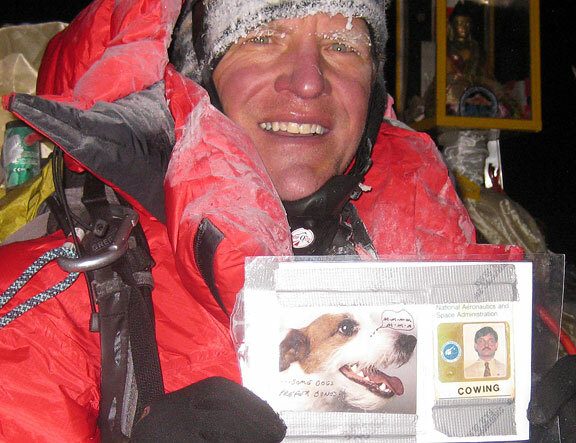 (see http://spaceref.com/news/viewsr.html?pid=51363). However, on 26 April 2018 the official Twitter account @JimBridenstine stated (in part) "... Excited to get to work on our plan to sustainably return America to the surface of the Moon starting with an aggressive robotic program." (see https://twitter.com/JimBridenstine/status/989653579043614720). Mr. Bridenstine's tweet seems to be at odds with action taken simultaneously by NASA HQ. 1. Has the Resource Prospector mission been cancelled by NASA? If so when was it cancelled, who cancelled it, and why was it cancelled? 2. Will NASA be issuing a public statement with regard to the cancellation of the Resource Prospector mission? 3. Will NASA be responding to the letter sent by the LEAG on the topic of the Resource Prospector mission cancellation? 4. How much has NASA spent to date on the Resource Prospector mission? 5. Will any Resource Prospector- related activities continue after the cancellation of the mission itself? If so what activities will continue? 6. Was Administrator Bridenstine referring to the Resource Prospector mission in his tweet?" By Keith Cowing on April 27, 2018 11:00 AM. "We wrote to Drs. Gerstenmaier and Zurbuchen to describe the community-wide support for RP on 2 March 2018, after the redirection for this initially HEOMD-led mission to be shared with the new Lunar Exploration and Discovery Program within SMD. We now understand RP was cancelled on 23 April 2018 and the project has been asked to close down by the end of May. This cancellation apparently stemmed from the transfer of RP from HEOMD to SMD due to lack of FY18 funding within the AES program and a misalignment between RP's goals and schedule and the new lunar program within SMD (which has different goals, timelines, and insufficient capability to deliver the RP payload). This action is viewed with both incredulity and dismay by our community, especially as the President's Space Policy Directive 1 directs NASA to go to the lunar surface. RP was the only polar lander-rover mission under development by NASA (in fact, by any nation, as all of the international missions to the lunar poles are static landers) and would have been ready for preliminary design review at the beginning of 2019." Keith's 26 April update: Oddly Jim Bridenstine's Twitter account said this hours after this letter complaining about a canceled lunar robotics mission. Mr. Bridenstine's tweet seems to be at odds with action taken simultaneously by NASA HQ. By Keith Cowing on April 26, 2018 8:13 PM. "Eos: Why wouldn't Jim Bridenstine have been your first choice? Bolden: He would not have been my first choice because he's a politician. And he is the first person, to my knowledge, ever selected from political office to become the NASA administrator. I don't think it's healthy for the agency to have someone who's a partisan in that position. The position calls for somebody who can carry out the president's agenda to the best of his ability but do it in a nonpartisan way and be able to work across the aisle. And I think his history is such that he may find some difficulty in working across the aisle." Keith's note: It is amusing to hear Bolden say this. He was not President Obama's first choice to head NASA. He got the job in great part due to overt political lobbying by Sen. Nelson. The bulk of Bolden's job was politics - internal and external. Indeed, his position was "political" in that President Obama nominated him to enact his Administration's policies. If Bolden had gained some political experience prior to heading NASA he might have made more headway on some of the ongoing political issues that he had with the White House and Congress. Just sayin', Charlie. By Keith Cowing on April 26, 2018 11:04 AM. "However, despite a requirement to compete task orders among all contractors, NASA approved sole-source awards for all 31 CRS-1 missions and the 8 CRS-2 missions awarded as of December 2017. With the addition of a third contractor under CRS-2, we believe NASA has more flexibility to compete task orders or possibly open the contract to new entrants through its On-Ramp clause that allows NASA to recompete contracts with new contractors for any missions beyond the guaranteed six. In addition, we believe NASA could realize substantial savings if Sierra Nevada uses a less expensive launch vehicle than the Atlas V currently planned for the company's first two missions. ... we question as premature $4.4 million paid to Sierra Nevada to begin certifying its second Dream Chaser configuration. We believe ISS Program officials should have delayed these payments until after the first Dream Chaser configuration is successfully demonstrated. ... Although less risky than the CRS-1 missions, all three contractors face technical and schedule risks as they prepare for their CRS-2 missions. Development and launch of the Dream Chaser spacecraft poses the greatest technical and schedule risk to NASA due to its lack of flight history and Sierra Nevada's plan to not conduct a demonstration flight. Additionally, Sierra Nevada intends to only build one Dream Chaser and this raises concerns about potential schedule delays if an anomaly or failure occurs." By Keith Cowing on April 25, 2018 6:15 PM. Gerstenmaier--now thinking we will fly EM-2 on SLS with ICPS. EM-2 will not carry PPE now, will get cmrcl launch for that. Learned from study we did re flying crew on EM-1 last yr that not as costly as we thought to human rate ICPS. Keith's note: Funny. Just last week MSFC was denying that there was any change in SLS launch plans. By Keith Cowing on April 25, 2018 5:27 PM. "If the Trump-Pence team pushes it, Falcon Heavy rockets could have more than 100 launches through 2024. The New Glenn, which will lift almost as much as the Falcon Heavy and will be rated to carry humans from Day One, could add another 20 flights between 2020 and 2024. Together, these approximately 120 heavy commercial flights would lift as much payload as 60 of NASA's Space Launch System (SLS) flights. However, there will be at most four SLS flights by end of 2024, according to current plans. Each reusable commercial flight will also cost less than $100 million, while SLS flights will cost $700 million to $1 billion per launch." By Keith Cowing on April 25, 2018 1:28 PM. "I wanted to let the workforce know that I have asked NASA veteran Tom Cremins to serve as my Acting Chief of Staff on an interim basis while I transition into the job of NASA Administrator. Tom led the overall transition effort and was critical to Robert Lightfoot's work to lead the agency over the past 15 months, and I know I will benefit from his 25 years of diverse NASA leadership experience. Tom will continue to serve as the Associate Administrator for Strategy and Plans, as he has since November 2015. I am grateful to Tom for his willingness to help in this role until I bring aboard a permanent Chief of Staff. Ad astra, Jim Bridenstine"
By Keith Cowing on April 25, 2018 10:31 AM. "NASA inspires the world with our exploration of new frontiers, our discovery of new knowledge, and our development of new technology. Our work benefits Americans and all humanity. Since NASA's inception in 1958 to present day, the Agency's history is written with each unique scientific and technological achievement. We have landed people on the Moon, visited every planet in the solar system, touched the Sun, and solved some of the core mysteries of our home planet. Today, our Nation's economic prosperity, National security, and cultural identity depend on our leadership in aeronautics, space exploration, and science. 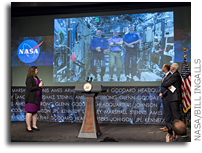 NASA accepts the challenge to continue our legacy of achievement and greatly expand the benefits we provide to mankind. Our success will be determined largely by the planning and investments we undertake today. This commitment is what drives our Vision, Mission, and overarching approach that form the core of our 2018 Strategic Plan." 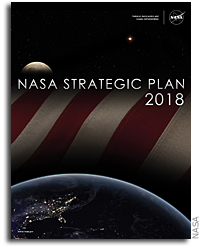 Keith's note: In case you missed it, NASA issued yet another "strategic plan" in February. As is the case with previous iterations this is neither "strategic" nor is it a "plan". Rather, this is just the annual NASA justification - done in reverse - of what NASA has already decided to do for one reason or another. And again, this document is written as if all of these things sprang forth logically from the stated strategic goals - goals that are constantly in flux - and were developed after all of these programs were already undertaken. One thing to note: the whole "Journey To Mars" thing is more or less gone. Mars, while mentioned, is no longer the agency's prime destination for human spaceflight. The Moon is now that prime focus for human spaceflight. How long before NASA tosses everything up in the air again? By Keith Cowing on April 24, 2018 6:03 PM. "The U.S. House of Representatives today unanimously passed the American Space Commerce Free Enterprise Act (H.R. 2809), which simplifies and strengthens the space-based remote sensing regulatory system, enhances U.S. compliance with international obligations, improves national security and removes regulatory barriers facing new and innovative space operators. The bill is sponsored by House Science, Space, and Technology Committee Chairman Lamar Smith (R-Texas)." By Keith Cowing on April 24, 2018 7:59 AM. "MS. WANG: ISS, this is headquarters. How do you hear us? (Laughter.) ISS, this is headquarters. How do you hear us? It is 220 million miles away. ISS? This is headquarters. How do you hear us? I'm being told in my ear that we're connecting through Johnson Space Center right now. MS. WANG: ISS, this is headquarters. How do you hear us?" By Keith Cowing on April 23, 2018 7:58 PM. "It is a great privilege for me to be here today, to be able to usher in on behalf of the President of the United States what we believe is a new chapter of renewed American leadership in space with the swearing-in of the newest Administrator of NASA, Jim Bridenstine," said Vice President Pence." "Greetings! It is my great pleasure to join the NASA team today. In the last few days, I have heard numerous times, "welcome to the NASA family." It truly feels like a family, and I am humbled to be a part of it. I want to thank the President and Vice President for the confidence they have placed in me and the entire NASA family as we continue NASA's critical missions. I also want to thank Robert Lightfoot for his strong leadership as the Acting Administrator during a time of transition and for his decades of service to NASA and our nation. His legacy is one of commitment to our mission and leadership in all capacities. NASA has a history of great leaders from the early days of Hugh Dryden and James Webb to our most recent leaders, Sean O'Keefe, Michael Griffin, and Charlie Bolden. I will do my best to serve our storied agency to the utmost of my abilities as we reach for new heights and reveal the unknown for the benefit of humankind. NASA represents the best of our country. We lead, we discover, we pioneer, and we inspire. I look forward to our journey together. Ad astra, Jim Bridenstine"
Keith's note: I took this picture in the "press spray" today at NASA HQ of the all hands senior staff meeting with newly sworn-in NASA Administrator Jim Bridenstine and Vice President Pence. This all happened at the last second. We did not expect this kind of access and then suddenly one of the VP's press people was escorting us past lots of security check points. FWIW everyone in the room seemed to be happy that the leadership issue had been settled and that Bridenstine is on board. At the meeting Pence said that President Trump wanted Bridenstine "in the Oval Office before the day is out". By Keith Cowing on April 22, 2018 6:05 PM. "Media are invited to see Vice President Mike Pence swear in Jim Bridenstine as NASA's new administrator at 2:30 p.m. EDT Monday, April 23, at the agency's headquarters in Washington. The ceremony will air live on NASA Television and the agency's website. Following the swearing-in, Vice President Pence and newly sworn-in NASA Administrator Bridenstine will speak live with three NASA astronauts currently living and working aboard the International Space Station." By Keith Cowing on April 19, 2018 2:44 PM. Keith's 19 April update: The vote tally today is 50 to 49. Jim Bridenstine is the next administrator of NASA. Vice President Pence was present in case there was a 50/50 tie. Sen. Flake waited until the last minute to vote yes and then Sen. Duckworth cast the final vote (No) for the day. Sen. McCain was not present for voting today. When/where Bridenstine will be sworn in is not known. But there is extreme interest in having Acting NASA Administrator Robert Lightfoot to hand over the Keys to NASA to Bridenstine before Lightfoot leaves NASA on Friday. 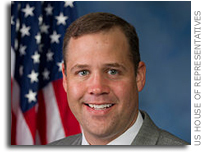 Continue reading Jim Bridenstine Is The Next Administrator of NASA. By Keith Cowing on April 17, 2018 9:07 PM. Keith's note: I guess ULA has adopted a humpback whale as a standard unit of measure with which to compare launch vehicles. In so doing Tory Bruno is now mocking - my mockery - of his original infographic with whales - except his original used trucks and tanks - and likely had its inspiration in part from Elon Musk's space Tesla. This is kind of like featuring Space Shuttle Enterprise in the opening of "Star Trek Enterprise" when in fact Space Shuttle Enterprise was named after the original USS Enterprise in a TV show. Or something like that - with time travel. By Keith Cowing on April 17, 2018 5:16 PM. 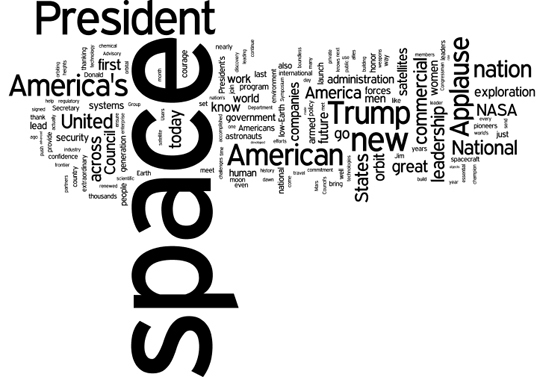 "You know, since day one of our administration, President Trump has been working to keep his promise to restore America's proud legacy of leadership in space, because the President knows that space exploration is essential to our national security, it's essential to our nation's prosperity. But the President and I also understand it is essential to the very character of America. The work each of you do in the skies and in space supports our armed forces, spurs scientific discovery, drives innovation, helps America's farmers feed the world, creates the jobs of the future, and fills the rising generation with wonder and pride. The companies represented here today, and the thousands of American companies that form your supply chains, employ men and women in all 50 states - men and women who helped build the most advanced rockets, spaceships, and satellites in the world." By Keith Cowing on April 17, 2018 3:56 PM. "The U.S. House Science, Space, and Technology Committee, chaired by Rep. Lamar Smith (R-Texas), today approved the National Aeronautics and Space Administration Authorization Act of 2018 (H.R. 5503) by a vote of 26-7. The bill was introduced by Rep. Brian Babin (R-Texas), chairman of the Space Subcommittee, and cosponsored by Chairman Smith along with 17 committee members. - Supports NASA using American private sector innovation and investments to unlock the economic potential of outer space"
By Keith Cowing on April 17, 2018 12:25 PM. "Spotted inside the temporary structure thanks to open flaps and a human desire for a breeze amidst the warm Los Angeles springtime, the main cylindrical component is truly vast - large enough that the eye almost glazes over it at first glance. Dwarfing the humans clambering about it, very rough estimates using knowledge of the tent's reported area (20,000 square feet) and size comparisons with machinery blueprints suggest a diameter of around 8-10 meters (26-36 feet), loosely conforming to the expected 9m diameter of BFR, as of CEO Elon Musk's IAC 2017 update." By Keith Cowing on April 17, 2018 11:03 AM. "The Aerospace Corporation's Center for Space Policy and Strategy (CSPS) released a new policy paper that explores future opportunities in cislunar space - essentially, the space inside the moon's orbit and the orbital area around the moon. 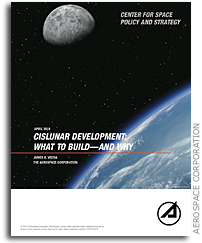 Cislunar Development: What to Build - and Why discusses the possible applications for cislunar space - for example, outposts on the moon, extraterrestrial mining operations, interplanetary waystations - and determines the infrastructure that will be needed to realize those ambitious goals. Author Dr. James Vedda, senior policy analyst with CSPS, says that the cislunar region remains a largely underdeveloped resource, and any coherent, long-term strategy for space commerce and exploration will need to make better use of it." By Keith Cowing on April 13, 2018 10:51 AM. "NASA plans to launch an initial, uncrewed deep space mission, Exploration Mission-1 (EM-1), in FY 2020. The mission will combine the new heavy-lift SLS with an uncrewed version of the Orion spacecraft on a mission to lunar orbit. A crewed mission, EM-2, will follow in 2023. The FY 2019 budget fully funds the Agency baseline commitment schedule for EM-2 and the Orion spacecraft and enables NASA to begin work on post EM-2 missions. Missions launched on the SLS in the 2020s will establish the capability to operate safely and productively in deep space." "NASA will likely launch its first astronauts into deep space since the Apollo program on a less powerful version of its Space Launch System rocket than originally planned. Although it has not been officially announced, in recent weeks mission planners at the space agency have begun designing "Exploration Mission 2" to be launched on the Block 1 version of the SLS rocket, which has the capability to lift 70 tons to low Earth orbit. Acting agency administrator Robert Lightfoot confirmed during a Congressional hearing on Thursday that NASA is seriously considering launching humans to the Moon on the Block 1 SLS. "We'll change the mission profile if we fly humans and we use the Interim Cryogenic Propulsion Stage (ICPS), because we can't do what we could do if we have the Exploration Upper Stage," Lightfoot said." Keith's note: Note that there is no mention of this substantial internal activity in Lightfoot's prepared statement at the hearing. One has to assuem that they would have rather not talked about this if at all possible. In addition to all of the excellent points raised in this article there is another looming factor that will affect this decision. 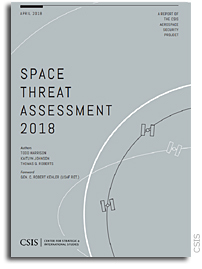 Readers of NASAWatch will recall that there has been a lot of chaos at NASA MSFC in the safety group that is certifying the SLS flight software. One of the things that scared this team the most was the sad state of current software and what would have to be done to human rate SLS - with the Exploration Upper Stage (EUS) on EM-2. Sources report that the internal consensus was that the software would have to be started from a clean slate in order to human rate the SLS. But, not only was NASA planning to launch humans on SLS for the first time on EM-2, they were going to launch them for the first time on a launch vehicle configuration that had never flown before (SLS + EUS i.e. Block 1B Crew). The last time NASA did this was STS-1. If this expanded use of Interim Cryogenic Propulsion Stage (ICPS) is going to become the new baseline, sources report that the task of human rating it will be simplified since they can start much earlier. And, when humans do fly on it there will be at least one full-up flight of the SLS+ICPS SLS Block 1 configuration (EM-1) under their belt. And then, of course, there is the issue of flying probes to Europa on SLS - a task Congress has put on NASA's agenda. The whole idea behind using SLS was to get there faster. ICPS is not the solution and Falcon Heavy becomes exceptionally competitive if that option comes forward. That said, the SLS software safety issue is still a mess - as will soon be revealed in internal and external reports on this situation. By Marc Boucher on April 10, 2018 10:28 AM. "Acting NASA Administrator Robert Lightfoot has named the Science Mission Directorate's Planetary Science Division Director Jim Green as the agency's new chief scientist, effective May 1. He succeeds Gale Allen, who has served in an acting capacity since 2016 and will retire after more than 30 years of government service." Advanced Planning For Reorganization and Layoffs at NASA? By Keith Cowing on April 2, 2018 2:02 PM. - Modern information technology (IT) will serve as the core function for Government to meet the needs and expectations of Americans while keeping sensitive date secure. - Data, accountability, and transparency will provide the framework and data to deliver better outcomes to the public and hold agencies accountable to taxpayers. - A modern workforce will drive needed civil service reforms to empower everyone from senior leaders to front-line managers to better align staff skills with evolving mission needs."